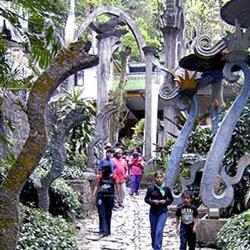 Discover Mexico's hidden jewels like Xilitla where a patron of Dali & Picasso, brought his artistic fantasies to life in an orchid forest. Cenotes are unique Yucatan attractions. In 2018, I made an all-Yucatan guidebook that started with this map and roadlog. This guidebook is specifically for drivers to the Yucatan peninsula who want to explore more than Chichen Itza and Cancun. 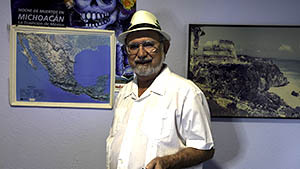 The map alone is good for people driving to Belize, or driving from Palenque to Escárcega, Merida, Cancun or from the Cancun airport to Chetumal, Chichen Itza and Merida or Belize. This map has realistic drive times for both toll roads and free roads, warning about what routes to avoid, touristic attractions, including Lagoon Bacalar and Xcalac. 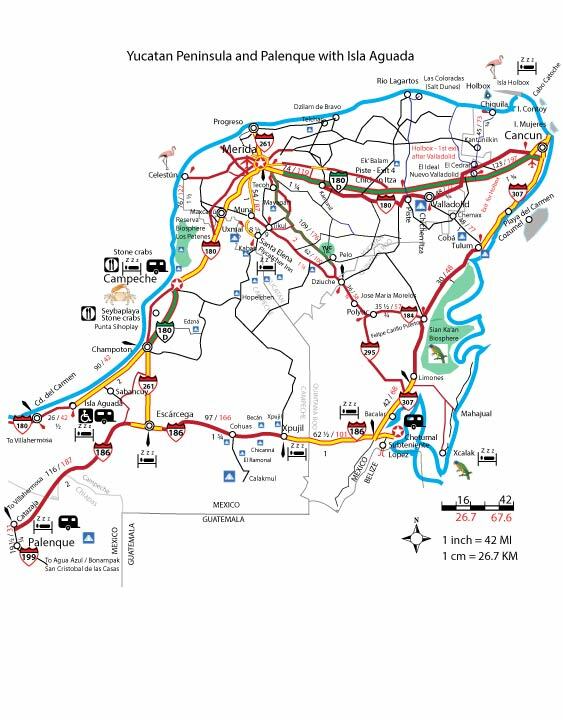 This map starts at Escárcega, Campeche, drives on to Campeche City, (and Uxmal if you like), Merida, Yucatan (with a map of the bypass of Merida), the toll road and free road route to Cancun airport. In-between that is Chichen Itza. There is a roadlog for the trip from the Cancun airport to Merida and an overview city map of Merida with a couple of my favorite hotels on it. At the Cancun airport shortcut from Merida, you can bypass Cancun city and drive to Pto. Morelos and the many high rise hotels on that part of the Quintana Roo coast. Or, you can take an earlier shortcut if going directly to Playa del Car men, though the road occasionally has quite a collection of tarantulas. If you are already "sold" and just want the map, go to my store nd buy it. Link at topof page. From Playa del Carmen, you can drive on to Laguna Bacalar (a little known jewel). Bacalar is also called the Lagoon of 7 colors or Laguna de Siete Colores.' Bacalar is called this because at sunrise or sunset, the lake appears to have seven color graduations. It is quite enjoyable. There is are hotels in all price ranges in in Bacalar. There is supposed to be an RV park but it was not open when I was there and I have heard it may or may not be open at different times. But I met people who were dry camping in a field and felt just fine doing that. From Bacalar, drive south to Chetumal or stop at Xcalac (also seen as Xcalak, which technically is the spelling of the Mayan archaeological site nearby), Quintana Roo. This used to be unknown, but now is developing like the rest of the Caribbean Coast of Mexico. Xcalac has fly fishing for tarpon among other fish, excellent diving at the Chinchorro Banks. Acocote Eco Inn (formerly Sandwood Villas) offers two bedroom condo rentals on the beach There are also other hotels and condos for rent at Xcalac. From Chetumal, you can drive on to Belize, or return to Escárcega, Campeche. If you are driving from Mexico straight to Belize, you won't go the above route. 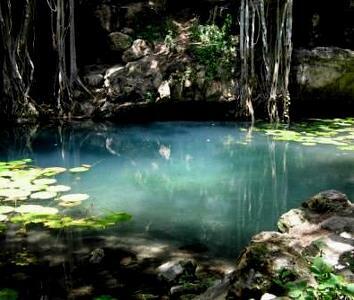 You will drive to Escárcega, Campeche and on to just outside Chetumal, Quintana Roo. Try to time your trip so you do not drive the road between Escárcega and Chetumal after 3 in the afternoon. The road is in excellent condition most of the time. But it just feels spooky and I am sure there is smuggling activity at night. Stay in Xpujil. The one bright spot on the road between Escárcega and Chetumal or from Chetumal to Escárcega is Xpujil (also seen on maps as Xpujil), on Mexican highway 180. There are worthwhile, and uncrowded, archaeological sites as Xpujil or (Xpujil), Becan, Calakmul. The Rio Bec Dreams is an interesting place to stay for special people who appreciate something different. Rio Bec Dreams is what I would call, high-class primitive. The jungalows are nicely designed and give you are real feel for being in the jungle. But there are lots of mosquitoes in the jungle and not all jungalows have their own bathrooms. You will meet an adventurous class of people here, which is a good thing. It is run by nice folks, Diane and Rick, who are speak English. Diane actually made her first drive to Mexico (from Ontario, Canada) alone after talking to me in 1997, before I left Sanborn's. I either reassured her that it was safe for a single woman to drive to Mexico or she just wanted to get as far away from a lunatic like me as possible. It was years ago and I don't remember which. Come to think of it, she may not have actually talked to me, only read my writings in the Travelogs, but somehow I influenced her. It is hell getting old and senile. Anyway, she and Rick made their home in the area and are fonts of information. They also have 4WD guided tours for reasonable prices. For someone old like me, or who has difficulty walking on uneven surfaces, you are better served by a hotel in or closer to town. There are about half a dozen in the area now, but I liked the Hotel Calakmul just before the intersection on the right. Great WI-Fi, good beds, no mosquitoes, excellent food. Secure parking. Oddly enough AA's Big Book is in every room, like the Gideon Bibles of yore. This driving map of the Yucatan peninsula is part of a complete book covering the whole area. Well worth the price, if I do say so myself. You can order it above.